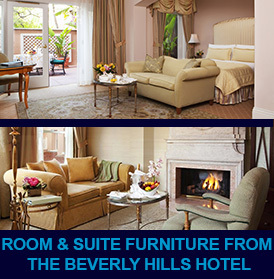 We Liquidate Fine Hotel and Resort Furnishings, Manufacturer's Overstock and Selected Brand New Furnishings! Since 1998, Hotel Surplus Outlet, located in Van Nuys, CA, has been a favorite furniture bargain source for discriminating designers, homeowners, set decorators and smart shoppers. Hotel Surplus Outlet is one of the nation's premier hotel furniture liquidators, and handles a wide variety of fine furnishings from luxury hotels and resorts. Hotel Surplus Outlet also warehouses and liquidates a wide variety of new overstock furniture, decorator goods & brand new furnishings. Hotel Surplus Outlet is a popular furniture shopping destination for a wide range of savvy shoppers. Since our inception in 1998, we have served hotel owners and institutional buyers, and in recent years we have become a major furniture shopping resource for the general public. We have a broad client base, including scores of home owners, set decorators and design professionals. Hotel Surplus Outlet's Van Nuys, California warehouse is open seven days and week to the public, and we have an ever-changing group of new furniture arrivals every week. We continue to grow by seeking an even broader range of furniture buying opportunities, including manufacturer's surplus deals, overstock furniture buys, customer returns, and promotional items. Hotel Surplus Outlet liquidates the best in hotel furnishings from some of the nation's finest properties, along with offering a growing range of deals and bargains on brand new furniture. As hotel liquidators we work closely with our clients to help them realize maximum recovery from their hotel furniture assets. Meanwhile, these fine hotel goods present a wonderful opportunity to a large group of shoppers seeing stylish, well built furnishings at a reasonable price. This has helped us to become well-known as a bargain source for smart furniture shoppers. Our unique operation has also garnered much attention in the national media over the years, and Hotel Surplus Outlet has been repeatedly featured on HGTV and other home improvement media outlets. Hotel Surplus Outlet and its parent company, The Fenning Group, LLC. are constantly seeking new acquisitions of fine furnishings from a variety of sources. 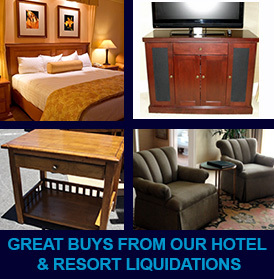 We are one of the nation's foremost hotel liquidators, specializing in fine furniture from renowned hotels and exclusive lodging properties. We are also constantly seeking opportunities to acquire excess inventories, discontinued items and close outs of fine furnishings and furniture from manufacturers, wholesalers and warehouses. Visit our About Us section to get a better understanding of the virtues of hotel furnishings and how we are able to make such great acquisitions. We work with buyers over a wide geographical area, but shipping issues and costs vary for every shipping location. We want to serve every buyer's furniture needs, but location and shipping issues are a significant issue which cannot be ignored. For starters, buyers and long distance shoppers should check out our FAQ page for more information. Call or email if you need more information and guidance. 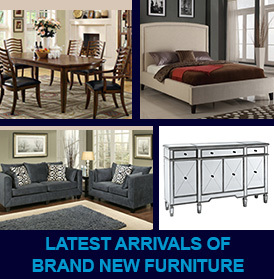 If you want to stay on top of new arrivals and sale events at Hotel Surplus Outlet please add your name to our email list by signing up where you see EMAIL OFFERS on the bottom of this page.